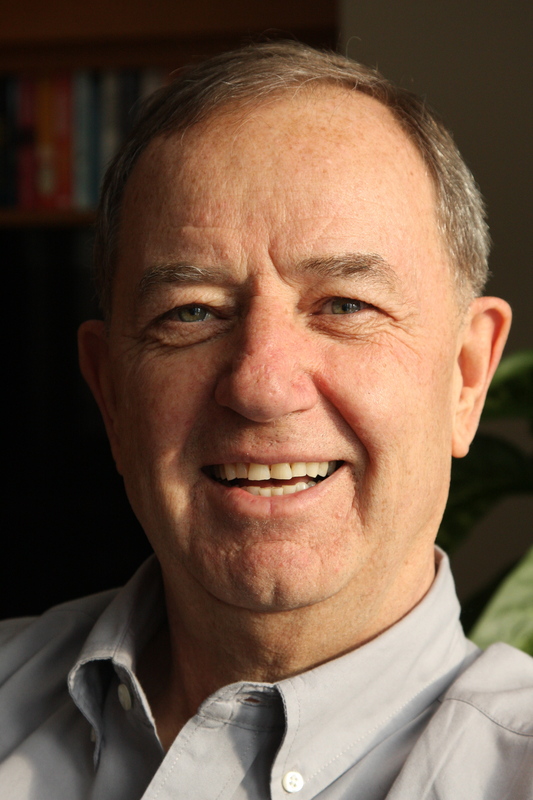 ← India and COP21 – not a Travelogue. Yes, there is a place called Heidi-land. It is in Switzerland and it doesn’t just resemble the movie home of our beloved Heidi; it replicates it. Read the book, see the movie; your internalized, glorified, mythical image of Switzerland exists. It’s here – in Heidi-land. Kristen and Chris live in Basel, at the corner of Switzerland, France and Germany. It’s Swiss but it’s flat, away from the mountains. So we are off to find the REAL Switzerland in Bergun, a small village half way between St. Moritz and Davos. Deep in the Swiss Alps, twisty roads through mountains, forests, steep sided canyons lead us to a small lush flat pastured area dotted with huge Swiss homes – barns, silage storage and human habitation all under one roof, most now converted to guest houses and ski chalets – Heidi-land. Our village has it all. 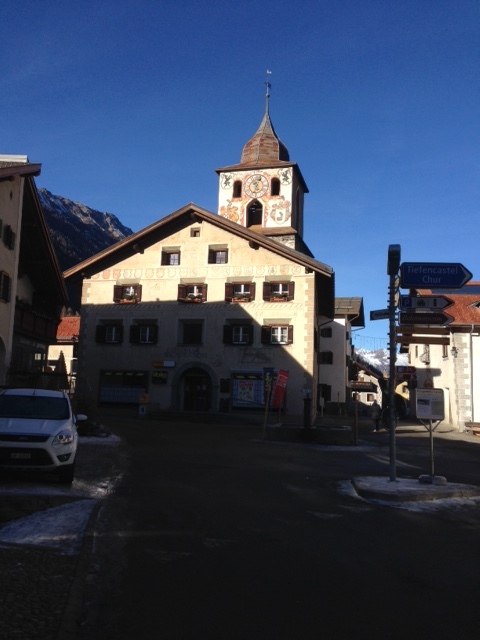 Our chalet is central, the village bakery is a shirt sleeve walk away, the bell tower, dating back to the 16th century, is the stage for an evening brass quartet concert; all creating a perfect frame for the women selling raclette in the corner of the square. Heidi will appear imminently, I know it. It’s late December, snow has not arrived; it is mild, sunny and unseasonably warm. Lack of snow doesn’t stop the Swiss from going outside. A few slopes are open with man-made snow for kids to enjoy. Tots as young as 4-5 seem to be skiing unsupervised, riding the poma lifts like seasoned pros. 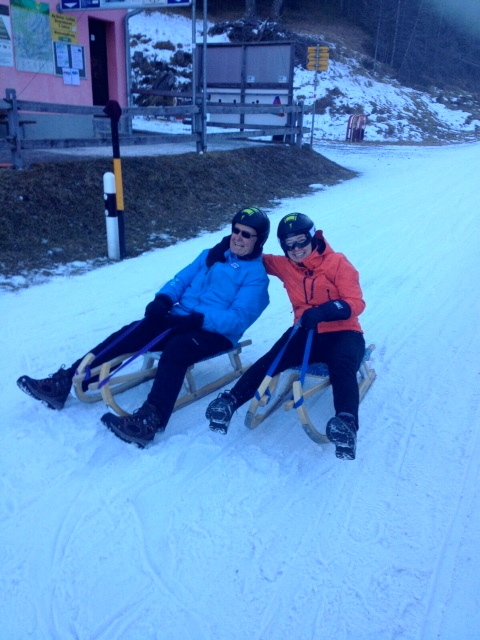 Real skiing has been replaced with sledging. We rent sledges and helmets, a dedicated train hauls us up through the valley spilling us out onto a wild 6 KM roller coaster back into town. I’m not enamored with the idea of sledging but there are tots gleefully jumping up and down at the train station ready to haul us up the valley so I feel compelled to prove my manhood – again. Every adventure worth its name demands an escapade involving protective headgear, so I go. We rocket down the run, Chris rockets faster and Kristen screams louder but we rock-et. 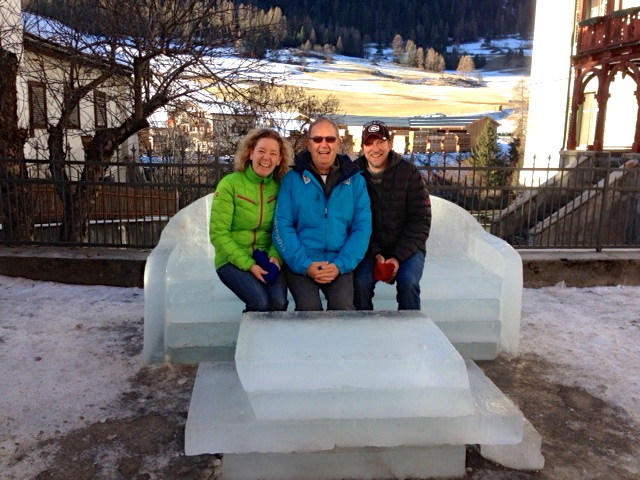 Our train waits to take us for another run….after we’ve had a sausage at an outdoor stand and cooled our butts on the ice-sofa. I’m so Swiss I could yodel! 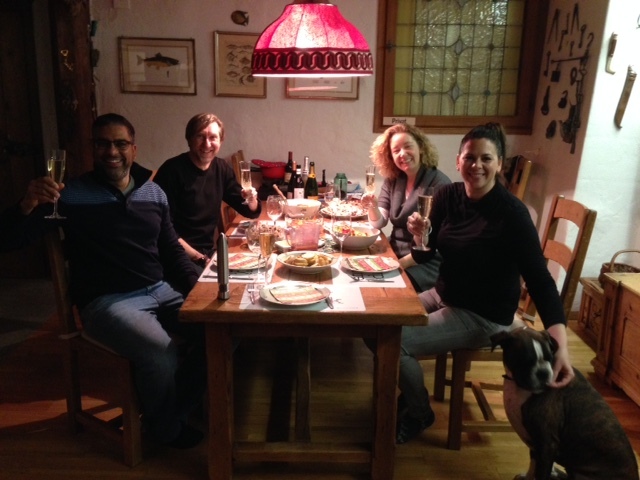 We finish our Swiss-movie day with Xmas dinner. Ginelle, Jeff, seven month old Linden and Desi the dog have brought an illicit French turkey smuggled across the border. We’ve cooked it up in Champagne (befitting a free-range, grass-fed, respectfully-sacrificed Dindon) and served it with all the fixings. A large bar of Swiss chocolate is all we need for dessert. Such a celebration! 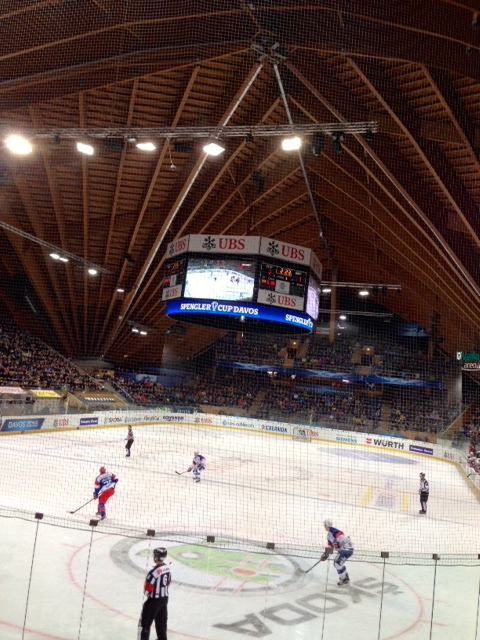 The other reason for our timely visit to Bergun is THE SPENGLER CUP. I have fond but vague memories of watching televised coverage of Team Canada off in some European ice hockey tournament – showing those boys how to really play the game. It seems these Europeans have been playing organized hockey for a while now – without Canadian supervision. 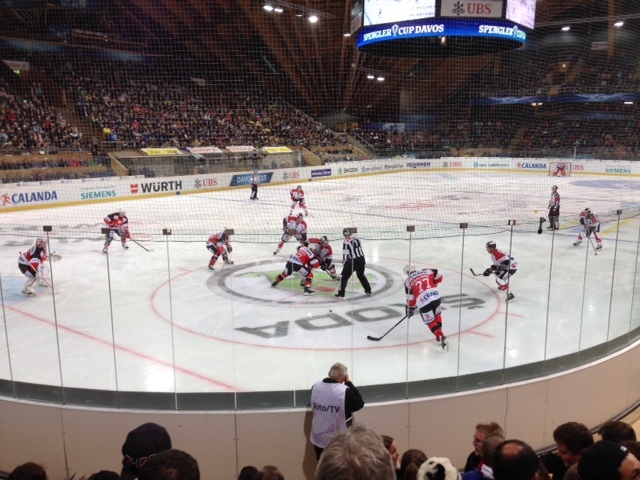 The Spengler Cup is one of the first, if not THE first organized tournaments, dating back to 1923. The six teams this year are all European club teams, two Swiss, a Finn, a Russian and a German. 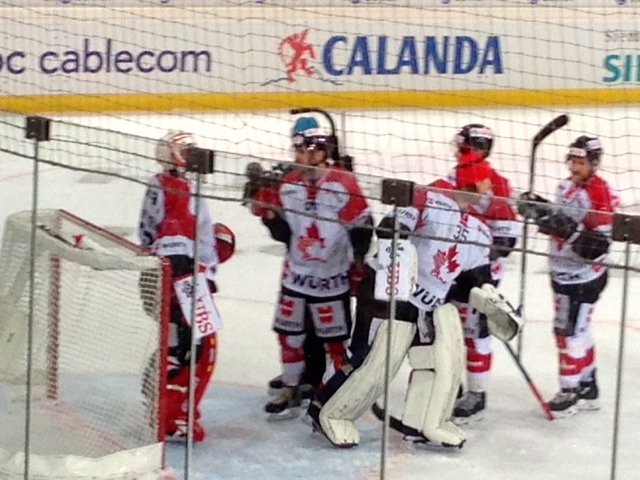 Team Canada is put together by Canadians playing with other teams in the Swiss professional hockey league. Many are ex-NHLers, extending their careers, many are here for the love of the game and a desire to play professionally wherever they can. The tournament starts Boxing day and finishes on New Year’s eve. Davos shelves its World Economic Forum image – this is young male beer drinking with a side of hockey. The hospitality tent is as large as the arena – an obvious sign. The Vaillant arena remains hallowed ground, a cathedral for ice hockey, it holds 6300, sold-out for every game – you’ll notice I didn’t say it seats 6300 – it doesn’t. Seats are expensive, even by NHL standards so we choose standing room. Each game about 1500 of the sweating, testosterone charged, beer drinking, chanting, singing masses (us included) are herded row by row onto risers to watch the game. Beer is efficently passed up the rows, money back down; they can do the wave with a beer in each hand. This exceeds every expectation I have ever held for polite rowdiness. The combination could not be more stark if you crammed the Mormon Tabernacle and Southern Baptist choirs together into a space reserved for a quartet. It’s noisy; songs, chants roil around the arena, feeling more like European football than our sanctified game. We get used to it, we have to – once in, you can’t wiggle your way out. 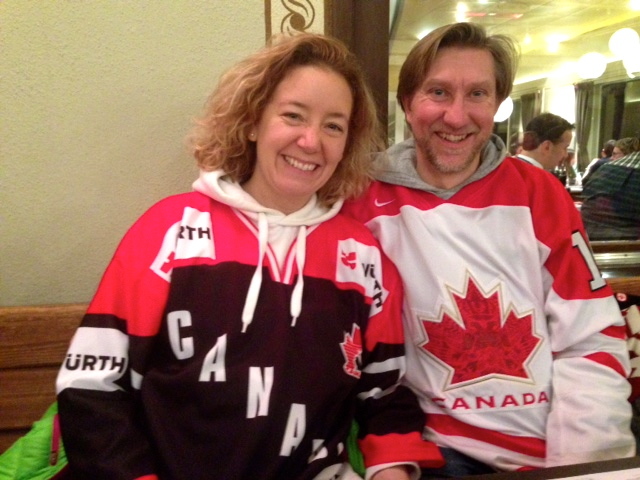 Kristen, Chris and I have ample supplies of Team Canada gear, there seem to be bogus Canadians amongst us – I start checking for MEC stickers and whether they say EH as corroboration of Canadian DNA – most don’t pass the test. But they love Canadians and cheer rabidly. Our boys do us proud. They have just met, two practices and a pre-game skate and they are ready to rumble. Rumble they do – winning all their games, they hoist the Cup on New Year’s eve. Then they go back to their regular jobs playing all over Europe. Here’s the best part. They play for the privilege of wearing the Team Canada jersey. That’s it – no money, just pride; a worthy discovery at any time – Canadian pride, unadorned. In the heart of Heidi-land I learn again what it is to be a proud Canadian. 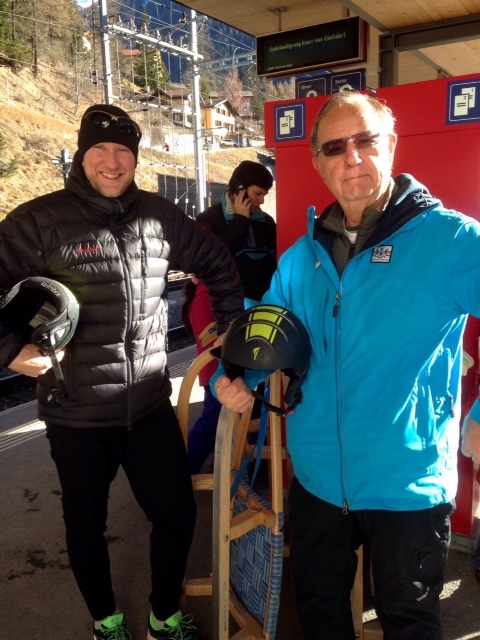 This entry was posted in Uncategorized and tagged Bergun, Davos, Heidi-land, midlife adventures, Off the Couch and Out the Door, Spengler Cup, Swiss hockey, Swiss sledging, Swiss vacations, Switzerland, Team Canada, Vaillant arena. Bookmark the permalink. 2 Responses to Hockey and Heidi-land.